I think we all know that everything that we do now, from communication to commerce, will all be done from our personal cell phone. In other words, that cell phone that we do everything on will do even more as it becomes our digital wallet. In fact, this technology is already in place in Japan. In some places, all you have to do is touch a certain electronic sensor with a cell, and your payment is processed. I’ve heard that these devices have been in place since 2000. San Francisco is trying to make strides in this technology with an experimental ticket-taker on the BART (Bay Area Rapid Transit). 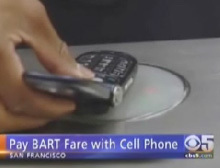 Passengers of the Bay City’s famed rail train can now walk through and scan their cell phone instead of buying a separate ticket. Not only can certain phones get you a ticket on the BART, but you can make purchases from Jack-in-the-Box. So far, they are only testing it out with 230 people with Samsung phones. Well, if this little experiment works out, it won’t be long before we won’t be carrying credit card plastic anymore, but you will just scan your phone. You better hope that no one steals your phone or all your financial information will be lost. Fortunately, you should be able to call and report it, but wait, you don’t have a phone! We all know this is true, everything will sooner or later go digi on us. Nothing will be sacred. Paper money and plastic cards will be things of the past. This is how the NEW WORLD ORDER will begin. First we start paying for things digitally, then they take this technology and put it into chips. Still not sure where am going with this? Ok it’s easy… No matter how we pay for our things, one thing is still problematic, if you lose your card or cell phone whatever you use and it gets stolen or lost, you have no access to your monetary till you call your bank for replacement so your financial account isn’t at the mercy of anyone. There’s a solution to no more theft or lost cards or cell phones- a chip. Small thin tiny chip implanted under the skin that hold access to ALL. Your entire financial balance, health, shopping, whatever it’s there and can be accessed by you swiping your chip across scanner. Now you see where am going? It was written in the Bible centuries ago and now it’s becoming a reality. Everyone will be marked by the beast in their right hand or forehead and no purchases be made without this mark- your chip. Say your peace with God soon because at first the world leaders will ask everyone to put this chip in their hand and it will be voluntary at first, but once the success rate proves good, it will become mandatory and I think you know what comes next if you refuse… Yeah, isn’t technology great LOL! No more privacy not even while taking a shower. For those of you ignorant or plain non believers, it’s cool, you can see for yourself am right about the mark of the beast being the chip. Every product you buy has a UPC symbol yes or no? Yes… Have you ever wondered why it has three lines elongated first, middle and last on all UPC symbols… Find out and the result will be a rude awakening even to non-believers as it is the scan bar language and those three lines represent the three numbers of the beast 666 hahahahaha don’t believe me then google search it yourself and when you see am correct. Sooner or later your life will no longer be private when you accept this chip be put under your skin in your hand. They already place them on dogs to help locate lost dogs- we are next.